This era opens with the May, a thorny hedging tree, and ends with the newly introduced parkland larch. The spelling is taken from the chalice, which has both Sprvstone and Sprowsone! There seems more prosperity, though still few people. Common land gets nibbled away. Overworn tracks like North Walsham Road have to be improved at the cost of travellers with animals and carts. Brick is more frequent, and wind power is better used; as the century advances steam would be harnessed. In 1839 Independents have a chapel and school. No more weavers are recorded here after the 1820s - the north captures the trade with new machines. Science has arrived! The site of the post mill which onceground flour is just opposite Shipfield, where a narrow grassy track winds up to the highest point to catch the wind. It's now built on. Alas, in 1933 it caught fire. It had just been restored. When you get off the bus here from Norwich, the air is sharp and fresh. The popular Victorian novelist George Borrow could speak many languages including Romany and was a skilled boxer. He loved these heights and the company of the travelling people here, praising "The Wind on the Heath, Brother!" The Harrison family were still milling here into the 1920s and as the carts turned right into the old access they had to sweep wide across Sprowston Road to enter it without an accident as they climbed up it. 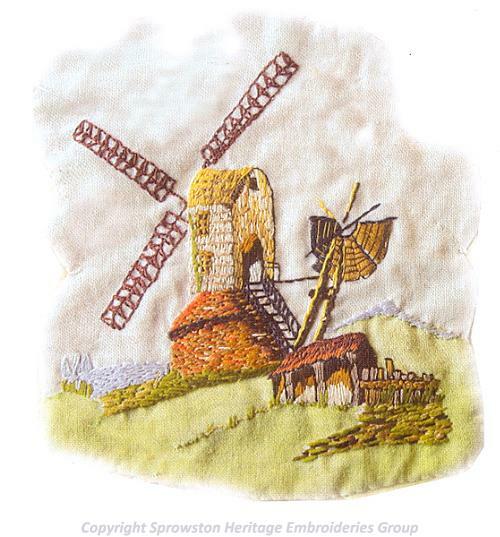 The windmill has been fondly painted by the Norwich School of Artists from various viewpoints on the Heath. Now it's the motif for local schools and the Parish Council. 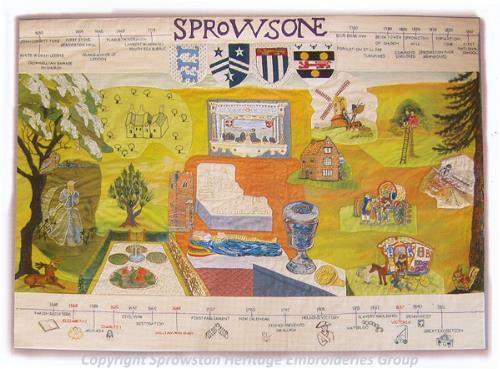 The tapestry also features a Bronze Age cemetery, St Mary and St Margaret's Church, St Cuthbert's Church, the legend of White Woman Lane, Sprowston Hall and Mousehold Heath aerodrome.